Maria Perez, 8, who one day would like to become a surgeon, decided to help Chinese children who needed surgery. So for her “Gotcha Day” (celebration of her adoption day), she asked family and friends for contributions to her cause. Her goal was to raise $500. She was overwhelmed with responses and the gifts that equaled over $1700! Maria truly changed the life of a child in China. The gifts from her Gotha Day, added to other donations, helped finalize the heart operation for 18-month-old Zhi Zhou from Henan Province. The July 12 surgery repaired the Pulmonary Stenosis that was putting stress on his heart muscle. 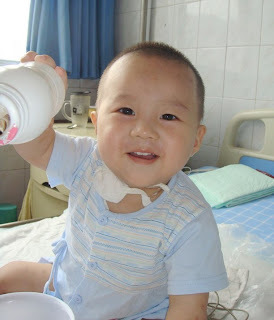 Children’s Hope-China staff writes regarding his recovery: Zhi Zhou can now get off the bed and play with other little patients in his room. He is so cute that everyone loves him. He has brought so much fun to them so they don’t want to let him leave. 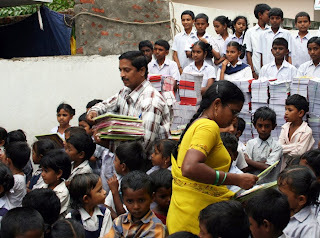 Today, we started helping the poor students with text books, notebooks, black boards, stationary - all their schooling needs. We collected over 20,000 items. The children and the teaching staff were so very happy for this great gift. 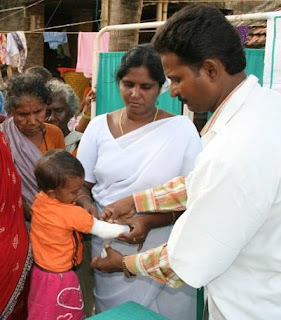 Over 7000 Indian children are receiving a free education at several Christian schools in Andhra Pradesh state. This is an education not one of them can afford. 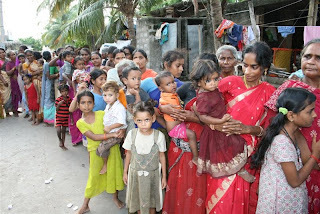 It can lift them out of a life of poverty and bring them the message of Hope. Because of the rapidly growing number of children attending, school supplies will be a continuing area you can help. Can you help one child from an impoverished home in India succeed at school? Mothers lined up to have their children seen by a physician at this outdoor clinic provided by a gift from a friend of Children’s Hope. For slightly more than 1 DOLLAR per child, you can make a real difference. 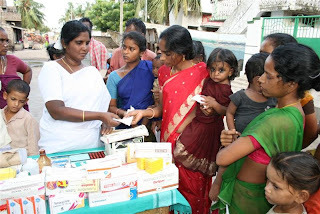 Today, we have conducted a medical program specifically for the children. Due to heavy rains and oppressive heat, many children are getting general sickness like fever, cough, cold, body pains, asthma, etc. So, our medical team really worked well today and helped about 200 small kids.